As we look back at 2018, we will reflect on the things most memorable. 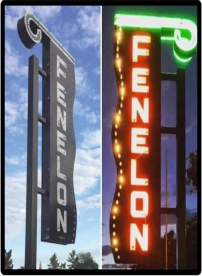 For the Fenelon Theatre Marquee committee, Saturday Sept. 29th is the day that will stay in our minds forever. After over 2 years of planning, meetings, fundraising, hard physical work, and so much more, we watched the Marquee lights go on (after a momentary delay). It would never have been accomplished without all the wonderful enthusiasm from our community. We received so much support from so many people both in Fenelon Falls & areas beyond, businesses (small and large), Eastern Ontario Development Program, and the City of Kawartha Lakes. It brought together a community through reminiscing about their trips to the theatre, about the friends they went with and the fun they had. We were so glad to be able to keep a very significant piece of Fenelon Falls history for everyone to enjoy. Thank you once again to everyone who contributed! January Winner - Lora S.
Fun in Fenelon, Support Local BusinessMegan Barton January 31, 2019 Fenelon Falls Chamber of CommerceFenelon Falls, Fun In Fenelon, Lora S.